The scheme aims to empower the students belonging to minority communities and prepare them for competitive examinations, so that their participation in government and private jobs improves. 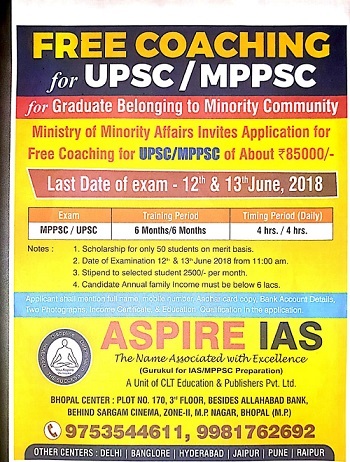 The scheme provides financial support for free coaching to notified minority students in selected coaching institutions. Aspire IAS Bhopal centre Madhya Pradesh run by CLT Technologies and Edu-Publishers Pvt. Ltd. formally known as CLT Education And Publishers Pvt. Ltd. Registration no. CIN. U80300DL2013PTC250204 is a empanelled institute by MOMA, New Delhi . i) Eligibility criteria for imparting free coaching. (Jain, Christian, Muslim, Buddhist, Parsi and Sikh) can apply for the course. 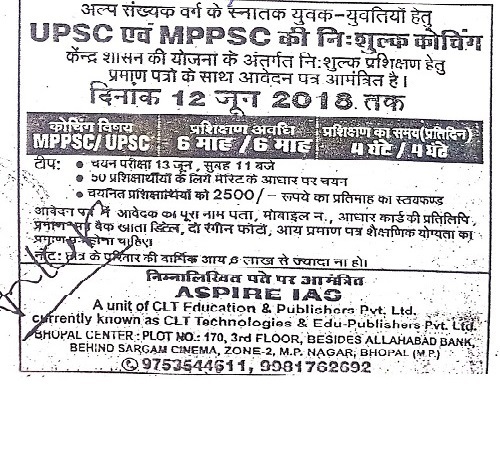 Plot no: 170, besides Allahabad bank, Behind Sargam cinema,zone-2, M.P. Nagar,Bhopal, Madhya Pradesh. Contact no: 0755-4906111, 9981762692, 9753544611.